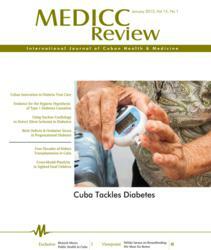 Oakland, Calif., (PRWEB) January 31, 2013Medical Education Cooperation with Cuba (MEDICC) today published a special MEDICC Review issue: Cuba Tackles Diabetes. The only English-language journal focusing on Cuban health and medicine, the MEDICC Review January issue features original research, features, and commentary from leading Cuban experts on public health strategies, challenges and novel Cuban therapies for this chronic condition. Diabetes afflicts an estimated 366 million people worldwide, a majority from developing countries or disadvantaged population groups in developed nations. An integrated, national strategy is one reason for low diabetes mortality in Cuba—the lowest in the Americas, but prevalence continues to double every ten years, reaching some 510,000 patients last year. Heberprot-P: A Novel Product for Treating Advanced Diabetic Foot Ulcer: registered in Cuba and 15 other countries, this innovative product has treated more than 100,000 patients with advanced diabetic foot ulcers.